Green Book has received a great deal of press for a number of reasons. For starters, the film took home the Best Picture award at the 2019 Oscars. Secondly, Green Book is centered around racial interaction, at a time when society as a whole is having a very important conversation about such matters. The film aims to be Odd Couple with a conscience (or maybe a more woke version of Driving Miss Daisy). The PG-13 rating hampers the film in this regard. It is difficult for the filmmakers to truly paint the picture of how harsh the time period was (the film is set against the backdrop of 1960s racial tension) without access to the R rating. As a result, some of the social commentary that the film attempts to engage in can come across a bit toothless. The film is allegedly based on true events but they have been slightly altered for cinematic effect. Viggo Mortensen takes on the role of Tony Vallelonga and Mahershala Ali steps into the shoes of Dr. Don Shirley. Dr. Shirley is suave and cultured. Tony is adept when it comes to weaving farcical tales and Dr. Shirley keeps his emotions bottled up. Tony is also more prone to anger. Peter Farrelly is more known for his comedic works and he came together with Tony’s son Nick to write the film. As a result, the movie tends to more slanted to Tony’s perspective. This hurts Green Book at times, especially when certain scenes seem to beg for more of Ali. An emotionally charged scene where Dr. Shirley bemoans the identity politics that keep him from feeling like he truly belongs is a prime example of what could have been. Green Book inverts the formula that viewers would expect by making Tony the hothead and Dr. Shirley the calm and collected one but this is not enough to overcome some of the hackneyed references that the script writers saddle these brilliant actors with. The film peddles grade school level insights as groundbreaking (did you know that all black people do not love fried chicken or the music of Chubby Checker?) but its well intentioned vibe carries the day. The plot, as it were, is focused on a two month tour that Dr. Shirley (a preternaturally gifted piano player who is also a closeted gay man) will be taking. Tony is prejudiced against black people but takes the job for financial reasons. The character development that takes place once the men are forced to spend time together helps to move the film along but there is a definite lack of subtlety here. Many of the scenes feel as if they have cribbed from better films and this adds to the feeling that the filmmakers are relying on tired stereotypes to make its points. On the whole, Green Book is uneven but the sterling performances from Ali and Mortensen cover for a lot of ills. Ali is also given the chance to play the hero and the film is able to steer clear of the ‘white savior’ complex that has bogged down so many other titles of this nature. This film offers a more mainstream take on racial tensions but there is still plenty to like for viewers of all backgrounds. 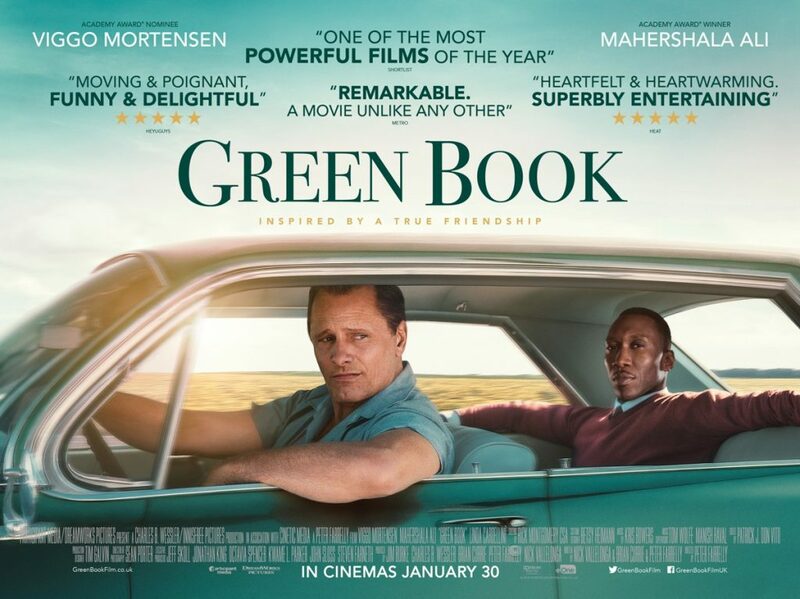 Witty and warm as cashmere, Green Book is a two-hander in which both stars soar with humor and heart. Is it a feel-good charmer poised to rake in greenbacks and Oscar gold? You bet! But don't let that keep you away from this overall well balanced (and timed) look forward from the safe distance of America's motley past. Both actors give such nuanced performances that audiences will swallow the sentimental moralising of peter farrelly's Oscar-nominated film. The true story of Tony Lip (Viggo Mortensen), a working-class Italian-American, who in 1962 was hired by refined African-American pianist Dr Don Shirley (Mahershala Ali) to drive him on a concert tour of the hostile Deep South.